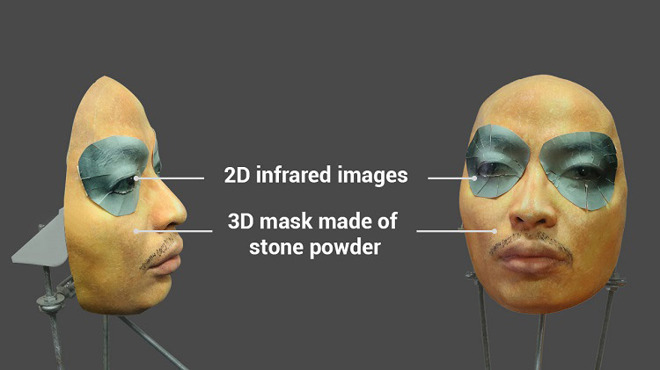 After supposedly tricking Apple's Face ID security system earlier this month with a $150 mask, Vietnamese security firm Bkav on Monday said it has repeated the process with a second 3D-printed mask that can also bypass iPhone X's attention detection safeguard. In its first video, Bkav demonstrated a proof of concept Face ID attack involving a 3D-printed frame covered in makeup, a silicone nose, 2D images and a large "specially processed" area. At the time, skeptics called Bkav's methodology into question. Notably, the security firm failed to record the Face ID enrollment process, meaning Bkav could have enrolled the mask as the device's primary user. Alternatively, Face ID might have adjusted to authenticate the original mask over the course of multiple unlock attempts as the system "learns" from consecutive successful unlocks, a feature designed cope with natural changes to a user's face. Bkav's latest video, however, runs through the entire enrollment process without cuts, suggesting the new mask — 3D printed from stone powder with eyes represented by 2D infrared images — did indeed circumvent Face ID's protections. Seen in the short clip, a human user erases the enrolled Face ID profile in system settings and sets up a new account in real time. The user unlocks the handset using his own face, locks it and carefully positions it in front of the mask dubbed the "artificial twin." Bkav's double successfully unlocks iPhone X not once, but twice. Perhaps more impressive is that Bkav was able to bypass Face ID's attention detection feature, an optional safeguard that monitors a user's eyes to verify that they are looking at their phone before unlocking it. In a blog post detailing the procedure, Bkav said the new mask cost about $200 to produce using materials and tools readily available to casual users. "About 2 weeks ago, we recommended that only very important people such as national leaders, large corporation leaders, billionaires, etc. should be cautious when using Face ID," said Ngo Tuan Anh, VP of cyber security at Bkav. "However, with this research result, we have to raise the severity level to every casual users: Face ID is not secure enough to be used in business transactions." According to the firm, fingerprint-based biometric security systems are superior to facial recognition solutions like Face ID. Fingerprints, the firm says, cannot be collected at a distance, while photographs can. That said, it is unclear what data Bkav used to create its second mask. Traditionally, 3D printed objects are rendered from highly accurate CAD files or three-dimensional scans run through specialized software. Whether Bkav was able to extrapolate dimensioning data from 2D photographs is unknown. Bkav's video is the latest in a string of attempts to defeat Face ID. Earlier this month a video showing a 10-year-old unlocking his mother's iPhone X surfaced, offering evidence that Face ID is sometimes unable to distinguish between family members who strongly resemble each other. Other unscientific tests involved twins, some of whom were able to unlock a sibling's device.